Detail from "The Maiden & the Jackdaw"
Our particular skills are kiln-fired painted stained glass. So we design and make new stained glass windows, doors and skylights. 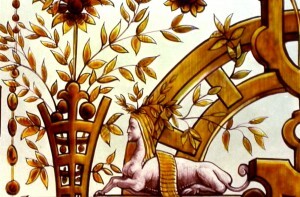 We also restore stained glass. And we teach the key techniques of kiln-fired stained glass painting. The studio’s name is Williams & Byrne. We’re near Ludlow, in Shropshire, the UK. We make new stained glass windows and stained glass doors or skylights in any style: traditional or modern, figurative or abstract – whatever is right for you and your chosen building. Right now, for example, we’re restoring a large set of heraldic windows for a castle and also making three new windows for various church. Last year we made 24 windows for the east and north face of a new tower. In 2015 we made four windows for the Chapel of the Holy Spirit at Wellington College, Berkshire. And before that we worked long and hard on a London mansion for which we made 17 skylights. Varied work: indeed, all the work we do for you is one-off (not mass-produced) to suit your wishes and the requirements of your particular building (old or new). See here for more about the new stained glass we design and make. 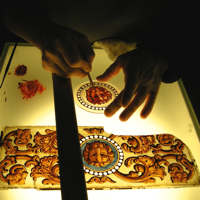 We take on difficult restoration/conservation work: for instance, where complicated painting skills are required or where you want perfect forgeries of broken ancient glass. Clients sometimes send us antique stained glass they’ve bought at auction in Paris or London, sections of which we re-paint or re-furbish as required. 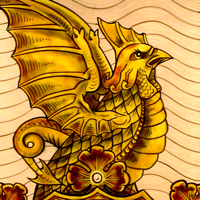 See here for stained glass restoration. 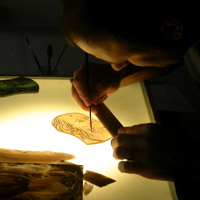 We work with other stained glass studios – for example: designing, painting or restoration – either in our studio, or we travel to them. David Williams worked with The Reytiens Glass Studio to help paint the Diamond Jubilee stained glass window for Her Majesty Queen Elizabeth II. David was present in Westminster Hall on 20th March 2012 when the Queen addressed both Houses and the window was unveiled. We focus on teaching how to paint stained glass (not cutting and leading). Our students travel to us from Australia, the USA, South Africa, Norway, Belgium, Canada, Kuwait, the Netherlands, New Zealand, Germany, Japan, Denmark, Singapore, France, the Republic of Ireland and Peru. If you’re interested in learning the techniques, this is our blog.